Some 82% of millennials say they get at least half of their news from online sources, according to a recent report from the Media Insight Project. Millennials report getting 74% of their news online on average, with little variation by age or other demographic factors, the survey found. The study was conducted as part of a collaboration between the American Press Institute and the Associated Press-NORC Center for Public Affairs Research; it included two components—a survey of 1,046 adults in the United States age 18 to 34 and interviews with small friend groups of millennials. “News” was defined by the researchers as “information that you need to understand the world around you”—including stories about sports, traffic, weather, current events, business, politics, and entertainment. 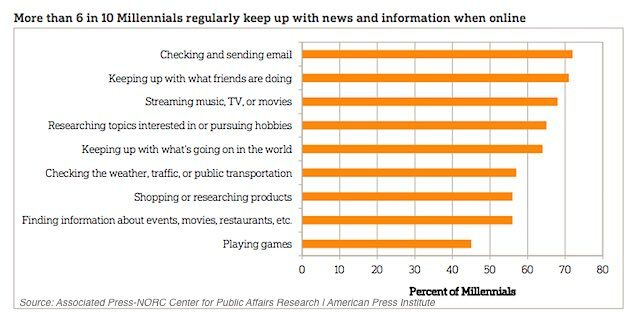 Some 64% of millennials say they go online to “keep up with what’s going on in the world”; this ranks as the fourth most popular digital activity after checking and sending email (72%), keeping up with what friends are doing (71%), and streaming music/TV/movies (68%). 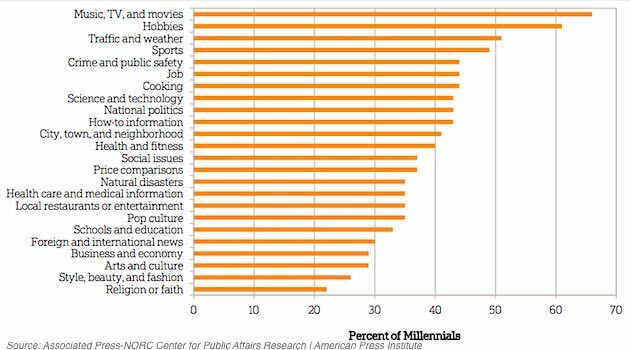 The average millennial reports regularly following 9.5 different news and information topics among the 24 included on the survey. The most popular topics are TV, music, and movies, with 66% of respondents saying they follow news about these areas on a regular basis. 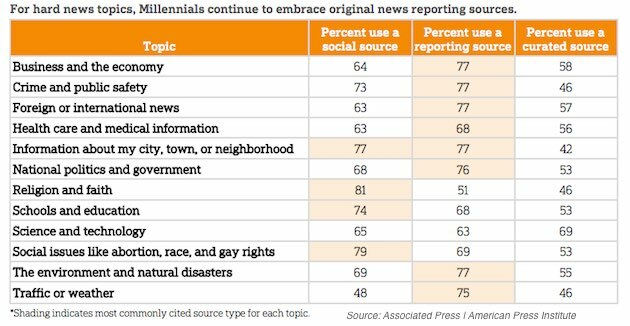 Most millennials report using a combination of sources to get news, including social, search, aggregators, online-only news sites, and traditional reporting outlets such as newspapers, television, and specialized media. 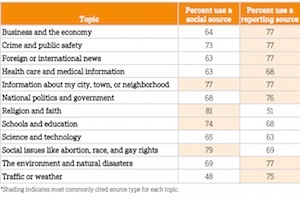 Millennials are most likely to turn to reporting organizations for news about government, business, international events, health care, the environment, traffic, and weather. Some 57% of millennials say that they first turn to online search engines when they want to dive more deeply into a topic. About the research: The report was based on data from a survey of 1,046 adults in the United States age 18 to 34, as well as interviews with small friend groups of millennials.